Anonymous Sale; Sotheby's, London, 13 December, 2000, lot 33. Medici, Michelangelo and the Art of Late Renaissance Florence, exh. cat. Florence, 2002, no. 66. Undocumented and incorrectly identified as Christ since its appearance at auction in 2000, Suzanne Butters has, on the occasion of its loan to the landmark exhibitions in Florence, Chicago and Detroit, identified it as a masterpiece of Renaissance carving. Mattias di Giovan Battista Ferrucci was the grandson of the Francesco Ferrucci, called Il Tadda (1497-1585), the most important craftsman associated with porphyry carving at the Medici court and who executed many commissions for Cosimo I, including a fountain for the courtyard of his palazzo and relief heads of Christ, Cosimo I and his wife and progenitors, all in porphyry (Detroit, Op. cit., 2003, no. 65). 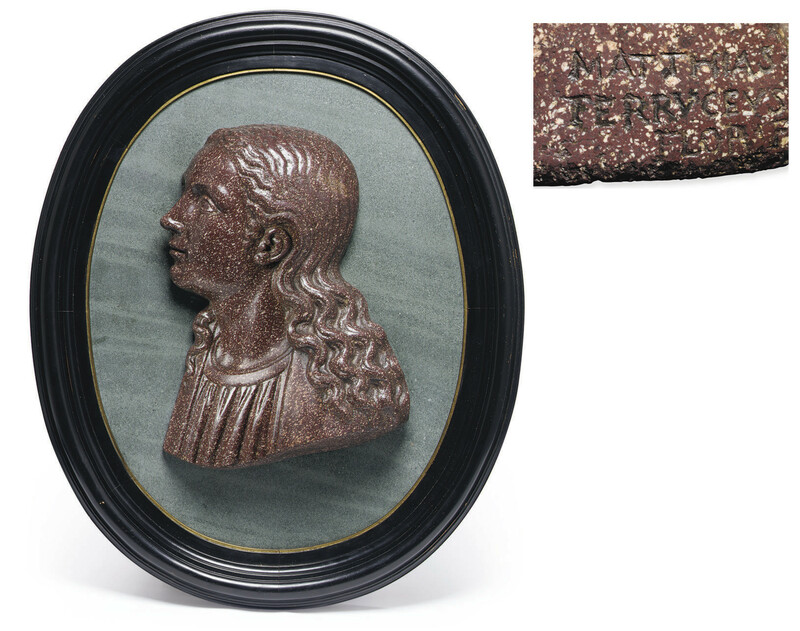 Mattias Ferrucci continuing in the tradition of his celebrated grandfather, not only executed the present relief but also a bust of Grand Duke Cosimo II in porphyry, and now in the collections of the Palazzo Pitti (Ibid, no. 65). Ferrucci, has modelled the present relief after the 14th-century fresco depicting the Virgin in the Annuciates Chapel within the Servite Church of Santissima Annunziata, Florence. The patron of this particular work has not been identified. And while the subject matter and the execution are extremely sober, the richness of the material emphasizes an appreciation of worldly pleasures. It would have been a commission of the highest order for Ferrucci. As Butters has also noted, not only would it have been instantly recognizable to Florentines and visiting pilgrims of the time, it is obvious that even carving such a relief would not have been possible without the permission of the Medici Grand Dukes. Only recently had the Medici, whose family had been the fresco's particular patrons and protectors for more than a century, permitted any copies of it to be made (Detroit, Op. cit., 2003, no. 66). Ferdinand I and Cosimo II both commissioned works for the Annunciate's Chapel and Medici versions in pietre dure continued to be made into the 18th century.